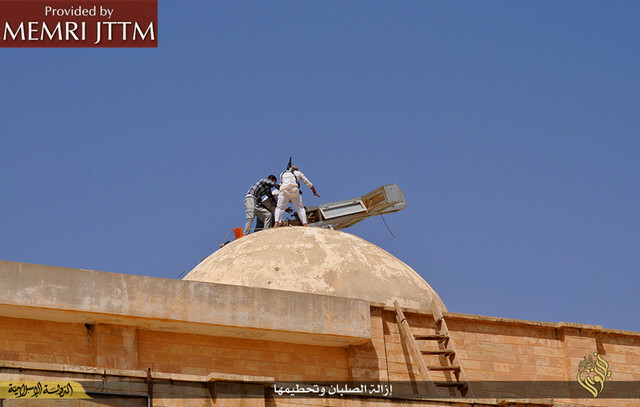 ISIS Removes Cross. Source: Shumoukh Al-Islam forum, March 16, 2015. Graeme Wood’s popular article of recent days gave ample evidence of the Islamic character of the Islamic State. Wood interviewed many of the founders of the Islamist movement and allowed their own words to reveal the true nature and motivation of those involved in ISIS. Read more. A key take-away from Wood’s article was a response to President Obama’s recent claims that to associate ISIS with Islam is a lie because “religions do not kill, maim, and enslave people.” Wood’s point was that unless we recognize the religious elements in ISIS ideology, we will be hindered in our ability to halt its advances in the Middle East and beyond. Of course it is inaccurate to say that ISIS is Islam en bloc, but to label the movement un-Islamic is to take a normative, and ultimately self-defeating, stance. It is an argument which ignores some very basic evidence regarding the movement and its history, and impedes proper understanding of what they believe and where they are heading. I have written previously of where ISIS might be found in Bible prophecy and Daniel 11:36-41 is my insertion point. Read more. The success of ISIS we have witnessed of late is quite clearly the type envisioned in Daniel 11:40-43 NASB. In the end, the prophecy takes a turn that seems possible in the modern-day, as threats from the east (Iran) and the north (Turkey??) will alarm him. Daniel 11:44. If Iran is the east and Turkey the north, there is much still yet to develop in the Middle East before certainty can be gained in fulfillment. However, if Daniel 11:36f is the correct insertion point, the initial success of the prophesied end-of-days kingdom, “will come to his end and no one will help him.” Daniel 11:45 NASB. NextISIS and the Pyramids of Egypt – Does the Bible tell us their destiny? It makes sense that Iran and Turkey are the countries referred to in Daniel. In your book you state “The Madhi’s army of Iranians and Turks, will attack Israel”. As I’m finally learning the difference between Shia and Sunni Islam, and speculating on timelines, would (Sunni) ISIS need to be defeated before the (Shia) Madhi appears and unifies Islam to attack Israel? If I am understanding this correctly, Turkey (mostly Sunni) would also have to experience some major event or catalyst to join forces with Iran and turn on Israel. Lastly, from a Christian perspective is the Dajjal and the Shia Madhi one and the same? Can you please elaborate? My thoughts are that ISIS is described in Daniel 11:36f. It will ultimately be defeated (Daniel 11:45) but only after annihilating many. I see the Mahdi as appearing further down the road after the defeat of ISIS, and possibly, rising in ISIS’ defeat. However, timelines are the most difficult to interpret in prophecy. For Iran to participate with Russia and Turkey will require a major eruption in world economics, including Iran being pressured by Saudi Arabia and its allies (including the U.S.) to the point that it is cornered. This “cornering” is not only militarily but also economically. We see this today with Saudi Arabia continuing to produce oil at record levels to maintain its market share and keep the price of oil at its lowest levels in years. This impacts Iran and Russia economically, and together, they are pressured and cornered. The greater the economic disaster the sooner they will respond. In short, ISIS will eventually fall. Iran will be pressured to respond. The Mahdi will rise up to fill the gap that ISIS creates. Your second question, “Turkey (mostly Sunni) would also have to experience some major event or catalyst to join forces with Iran and turn on Israel.” , is not as easy to answer. I have never seen Turkey as having the significance that many contemporary interpreters place upon it (Joel Richardson, Walid Shoebat). To me, modern-day Turkey will certainly align in the alliance of Ezekial 38, but not as a major player. Turkey is a part geographically of the Assyrian empire of the ancient days as is Iran. Yes, I concur that a catalyst must occur for them to join forces; but when it comes to world wars, alliances are not so much based on logic but on what works. Turkey’s alliance with Russia and Iran will be because it works for them. We cannot know what this will be until it happens and we see it. Russia’s advance against the Ukraine may prove to be the first step in the process that will force Turkey to choose sides, i.e., to choose the Russian side rather than the American side.